My boy is dairy and egg free living amongst serious egg eaters. 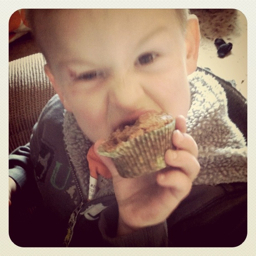 Today I made him some muffins. I accidentally ate 2 of them myself. Wow. Combine all ingredients. Extra points if you let a 3 year old do the banana mashing himself. Bake however you normally bake muffins. My oven is weird, so you don't want to bake it at the temperature I chose. Unless you're into crisp muffins. dairy and egg free!? ouch.